The Free World Forces in Vietnam always declared a truce and stopped operations against the VC and NVA on significant public and religious holidays. In return these truce were not always honoured by the NVA/VC; one major example known as Tet’68 was the country wide offensive at the end of January 1968 when the NVA used the Vietnamese New Year truce and stand-down in allied operations to attempt to o verwhelm the South Vietnamese forces across the country. At other times a truce might be broken locally by VC parties deep in the bush who were not even aware that a truce had been called. So when a truce was announced for Christmas Day 1969 while 6RAR were occupying FSPB Picton and patrolling the Nui May Tao mountain area there was speculation among the soldiers as to how safe the occasion might be. Never the less the Australians elected to respect the truce and treat the occasion as special. The 24-hour truce started at midnight 24 December - troops were not to initiate contacts but were to defend themselves. No H&I were to be fired. For Christmas 1969 the majority of W3 Coy was concentrated on the North side of the Nui May Tao mountains but 1Pl and the mortar sect were at FSPB PICTON. At PICTON the first sign of the Australian celebrations occurred during the darkness after stand-down on Christmas Eve when the song ‘Silent Night’ suddenly drifted across the base from the pitch black skies above. 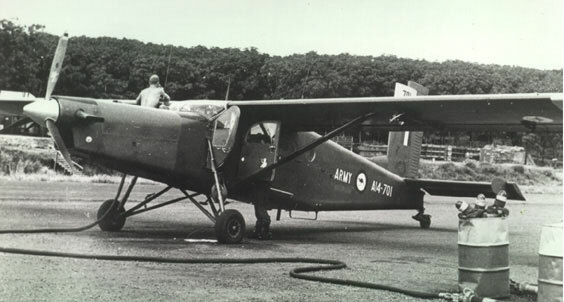 A Pilatus Porter psy-ops aircraft from 161 Recce Flight at Nui Dat fitted with loudspeakers to broadcast political messages to the VC had for the evening been given a new role playing Christmas carols to its own side deployed in the bush. Invisible and able to drift slowly across the sky, the plane moved back and forth for over an hour entertaining the troops and remind ing them of what would be happening among loved ones and family back home. At midnight the 6RAR padre led 60 or so soldiers out across the LZ to stand just inside the wire for a church service. We stood with our backs to the wire [and any likely threat from outside the base] while the padre reminded us of the message of Christmas – peace love reconciliation and grace, in sharp contrast to the otherwise daily business of the unit. After a 30–minute service with carols nervously sung by torchlight we returned to our dugouts and duties. Christmas morning Santa Claus visited the base, courtesy of 9Sqn RAAF who rather spoiled the occasion by painting on their helicopter doors the message “merry Christmas oink oink you grunts”. Santa spoke to the CO and other base staff while looking resplendent in his red suit with black belt and 9mm Browning pistol. The fresh rations delivered with the helicopter were a cut above the normal breakfast. 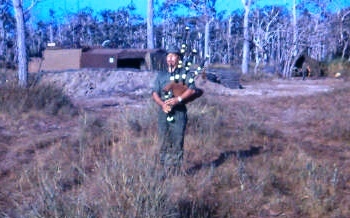 After breakfast the 6RAR Pipe-major entertained the troops with a few bagpipe renditions, after which we spent the remainder of the day relaxed in-place, with t he conversation mainly about whether ‘Charlie’ would use the truce to move around. Patrols had been left outside the wire from the day before as a small measure of security and we wondered what they would do if the VC did wander into their positions. Significantly none of us left our weapons behind when we moved around. But then perhaps the pipe-major had scared the VC away. 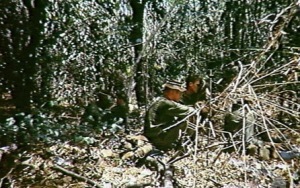 The base was abandoned on 27 December when 2RAR returned to Nui Dat but W3 Company was almost immediately redeployed on a 3-day operation [Op Bluewater] and didn’t actually celebrate Christmas in the traditional way until 1 January 1970. I Was There - Stephen Fitzsimmons 104 Sig Sqn, "I had forgotten about Silent Night, thanks for the reminder. I remember Santa arriving with the red smoke trailing behind the Huey, the caption on the side of the chopper actually said "Merry Christmas to all oink oinks", I don't think they meant any disrespect by it. We were given one goffer between two of us as a Christmas treat". 'I Was There' - add a comment what was your Christmas 1969 experience..? 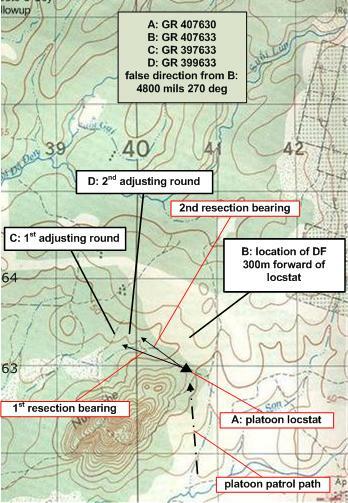 This is a technical article concerning lessons learnt by a mortar fire controller [MFC] about navigating in the close-country and flat terrain of Phuoc Tuy Province Vietnam, and how to safely adjust indirect supporting artillery fire when uncertain of where the rounds would land. 90% of a MFC’s job is to navigate; the MFC needed to ‘know’ where the platoon was at all times so that when in sudden contact with the VC there could be timely, safe and accurate indirect artillery or mortar supporting fire. In the era before global positioning systems [GPS] Phuoc Tuy province presented a number of challenges to those required to accurately locate themselves under the canopy. Many of the expected aids such as compass resection or built-up areas were missing, either hidden by the canopy or stretched out across the mainly flat terrain. 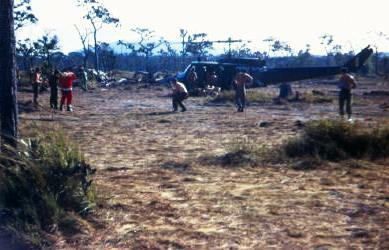 Even helicopter pilots were unable to penetrate the canopy and were reliant on ground troops ‘throwing smoke’ to enable them to be located. Yet to not accurately locate yourself with a topographical map reference could mean poor support from indirect fire weapons, the potential to blunder into other friendly troops, and the likelihood of never finding your objectives. Whenever a platoon deployed on an operation it would do so into an AO [area of operations] defined by a series of map coordinates. It was required that the platoon remained inside those coordinates to avoid bumping into other friendly troops. It was also a requirement to pass regular ‘locstats’ so commanders and those required to coordinate indirect fire support clearances could know where the troops were. There were many instances where inaccurate locstats led to friendly artillery fire landing on the unfortunate ‘lost’ troops. As a MFC I can well remember the cringe I developed each time I waited for the first round of a fire mission to land, hoping that that day I had not made a major mistake and someone was about to be injured unintentionally. It was because this scenario was so prevalent that the first indirect round of any engagement was required to land 1000 metres away from any friendly forces. Ever resourceful, the troops used ‘dead reckoning’ to overcome the limitations. ‘Dead reckoning’ in Vietnam required the troops to march on a compass bearing from a known point and to record the number of paces taken between stops. At a tactical stop groups of soldiers would mutually review the distance, bearing, and nature of the ground covered to arrive at a reasonably accurate consensus. In a typical platoon this group would include the platoon commander [ultimately responsible for the locstat] the lead section commander [who had seen the vegetation in front of the platoon] and the element in platoon headquarters responsible for managing indirect fire. Given I spent 90% of the time focussed on navigation I was frequently impressed by the accurate navigation done by the lead section commanders who could only safely think about navigation perhaps 20% of the time [the remainder of their time being devoted to directing their scouts, analysing the terrain, and generally ensuring the platoon was not surprised tactically by the enemy]. There were several aids employed in ‘dead reckoning’. The most obvious aid was a reliable compass. 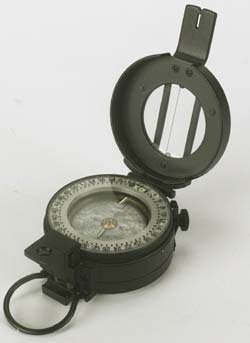 The NZ issue compass was the British M-73 prismatic which was constructed of brass and sturdy enough to cope with the daily movement of the owner [the alternative flat plastic US Army version of the Silva compass lacked the prism sight and was subject to damage from insect repellent which ate the marking off]. 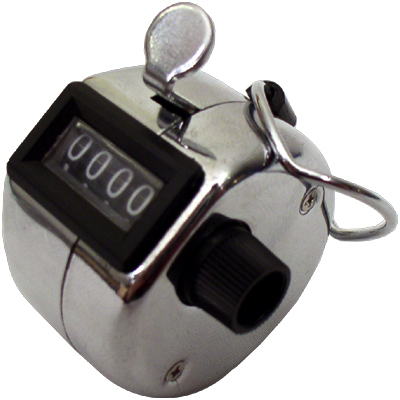 The next aid was a pace [or tally] counter, normally attached to the personal weapon and pressed for each pace the left foot took [on average in close-country a step with each foot would equal a metre]. A comparison of the different pacing records would give an average of the likely distance the platoon had moved. With these two aids a direction and a distance travelled in that direction gave a rough estimate of the present location. The next aid was a topographical map [sometimes a photo map was also provided if the terrain in the area had been extensively altered]. Although showing few obvious features it was surprising how accurate reading the map could be. 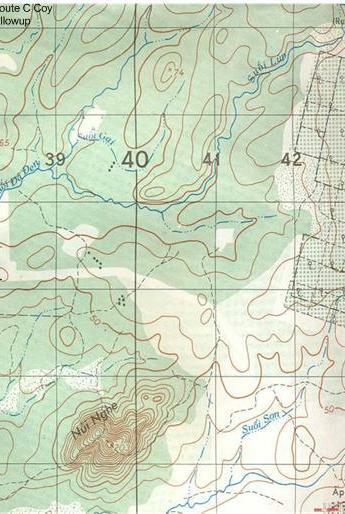 A study of the few contours, stream directions, shape of clearings, and changes in vegetation all assisted the navigation group to take their average and refine it into a locstat accurate to within 100 metres. Dead reckoning however required that the start point be accurately established, something not always possible given the usual sudden arrival by helicopter into a jungle clearing with the subsequent mad scramble to get clear of the open spaces. The final aid was a circular protractor. In the military these are in mils [civilians use degrees] and are used to plot bearings from a compass onto a map [such as a resection] or to obtain bearings from a map on which to march . Normally a further calculation is required to include the effect of magnetic variation but in Vietnam this was negligible and ignored. 6-figure map reference [locstat of target] pinpointing where on the ground the indirect fire was ultimately required [usually the present enemy position or their anticipated escape route]. Providing your own locstat as the point from which the mandatory 1000 metre safety addition was made was not recommended for if the supporting artillery plotted the locstat BUT forgot to add the safety margin the fire would land on your location. distance along the adjustment bearing to where the initial round would be plotted to fall to meet mandatory safety requirement [usually ‘add 1000 metres’]. Fortunately indirect fire controllers could use the explosions from indirect fire as an aid to help them establish an accurate locstat since knowing the location of the explosions allowed the observer to do a compass resection; shooting a compass bearing to the known point and converting it into a back bearing to establish a line back to your own position. Depending on the situation there were three approaches to using the indirect fire; all were similar in application. 1. If there was no urgency to provide an accurate locstat the sneaky approach was to eavesdrop on the fire control net until another call sign close by asked for a fire mission. Details in the fire request included a grid reference, adjustment compass bearing, and a safety addition. Using this information to plot where the rounds would fall and doing a compass backbearing on the explosion would provide feedback as to your own position. 2. If there was an urgent requirement to establish your location the anguished approach was to request a ‘mark mission’, meaning the artillery would fire on one or more spots to allow the compass resection to take place. Mark missions however were unpopular, receiving very low artillery priority and platoons often couldn’t afford to wait for it to come to the top of the fire mission task list. It also implied the platoon was poor navigators, liable to ridicule from the artillery involved. 3. The subtle approach used the nightly defensive fire [DF] tasks to get the compass resection. Nightly DF tasks were routine but for the purpose of compass resection needed to be done using false direction, which also provided an extra degree of safety to the platoon calling the DF. I preferred the subtle approach. Let’s examine the safety issue in more detail. Using ‘dead reckoning’ involves a compass bearing and measuring distance moved from a known point. In close country a compass bearing is accurate enough to keep direction, subject only to a slight user bias [e.g. where a person always goes left around any trees blocking the route and over time would be to the left of where the bearing is pointing]. But pacing had the potential for greater error; starting from an imprecise point, assuming every left pace was a metre, not compensating for downhill or uphill movement, etc. This meant firing indirect weapons along the same axis as the bearing could reduce the safety margin to a dangerous level but could be overcome by having the safety margin to one side [see diagram] as the degree of error sideways would likely be smaller than the degree of error from movement along the bearing. The diagram on the left serves to illustrate the procedure. The platoon is located [hopefully] at A: having approached the position from the south. The hill to the west is unlikely to be visible. My first DF was always on a cardinal compass bearing forward about 300 metres [B: is north 300 metres] with an adjustment bearing either left or right 1000 metres [calculation was bearing plus/minus 90 degrees/1600 mils and reported as if I was at position B:]. In the illustration I have gone left or west. Having technically chosen a false position and bearing I could plot the ‘expected’ detonation [C:] and the back bearing from it to A: before I allowed the first round to be fired. The Pl Sgt and I would take the compass bearing to the first explosion, hopefully 1000 metres off to a flank, and check it with my ‘expected’ bearing. If the ‘actual’ was close to the ‘expected’ bearing I would then order a drop of 200 metres along the adjustment bearing [D:] and we would take another bearing. After the first round had landed safely away to one-side there was a greater degree of confidence that the present location was safe from an accident. The second bearing would be plotted to check the earlier locstat accuracy and any re-adjustment to the locstat could be calculated. I would then finish the DF or adjust it further so that it would be useful if required during the period the platoon was stationery. Having the DF located 300 metres in front meant the second round was on an angle that allowed me to not only have a different back bearing with each round but also enabled me to establish distance. It also meant the artillery round was not dropping straight toward me in case there were errors on the firing line. I also found that sticking to cardinal points of the compass assisted me maintain a picture in my head as to where indirect fire was falling and what I next needed to do when adjusting it. Dead reckoning (DR) is the process of estimating one's current position based upon a previously determined position, or fix, and advancing that position based upon known speed, elapsed time, and course.